© 2019. Horsham Football Club. All rights reserved. 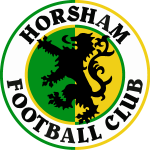 Horsham Football Club Limited. Registered in England No. 1494925. Limited by Shares: Major Shareholding (38.16%) Horsham Football Club Trustees. Registered Address: 30-34 North Street, Hailsham, East Sussex BN27 1DW Website by Matt Axell.